Rough Skinned Newts, or “Rough-skinned Newts”, are newts (small semi-aquatic salamanders) living in the humid coastal areas from Alaska to the southern areas of California. 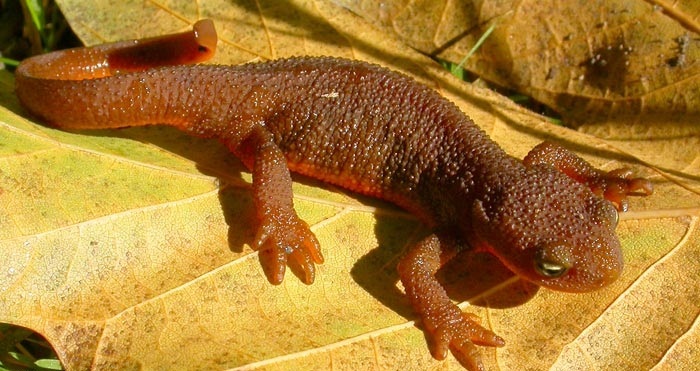 They are also known as the “Rough Skin Newts”. They are well known as poisonous creatures. These creatures have a medium-sized, stocky appearance. 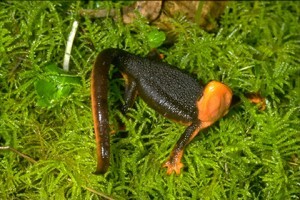 The dorsal side of these newts is usually of a dark brown color. They can grow anywhere from 6.5 cm to 12.5 cm in length. The ventral side is of a bright yellow or orange. There is a crest which runs all along the lower side of the tail. The skin usually appears to be dry and granulated. But during the breeding season, their skin becomes smooth. The limbs of this creature are well developed. They are also well identifiable by their flattened head. A certain kind of toxin is secreted by this species as a part of their defense mechanism. According to the evolutionary theory, the Rough Skinned Newt- Garter Snake relation is considered to be an example of co-evolution. Sometimes, when two creatures are related to each other (example: predator- prey) the evolution of one triggers that of the other. This process is called co-evolution. Garter Snakes came into existence as predators of the Rough Skinned Newts which served as their prey. The snakes evolved to resist the venom of the newt. As a part of the evolutionary process, the newts evolved to produce even stronger poisons while the Garter Snake developed offspring with an even greater ability to resist the poison and prey on the newts. In this way, the evolution of both the creatures is dependent on each other. These creatures are highly toxic. Their skin secretes a poison, also referred to as Tetrodotoxin, for defense purposes. Its effects range from paralysis to death. Ingesting this poison may cause death, even of a human. It may cause skin irritation in case of direct contact. These creatures are principally the inhabitants of the West coast of United States. They can also be found in British Columbia. 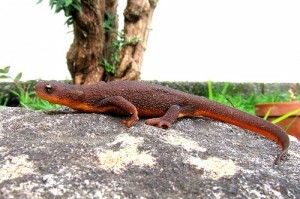 The southern range of the Rough Skinned Newt habitat extends to Santa Cruz in California and the northern ranges to Alaska. They can be occasionally found in areas as far as Montana. There is one isolated population of this species living in several ponds and pools in the north of Moscow. In all probability, they are not the natives but were introduced in that area. These creatures migrate to water during the breeding season. They secrete a poisonous substance that can keep most of the predators away. The neurotoxin in this poison can be fatal and cause death, even of a human. If a rough skinned newt is attacked, it takes a defensive stance and shows off the bright color of its underbelly. As most animals associate bright colors with poison, they retreat on seeing the bright orange skin, leaving the newt unharmed. The general breeding season for this species is in the months of March and April. But it may vary according to the habitat and take place anytime between late December and June. These creatures are believed to reproduce in alternate years. The reproduction of this species is aquatic. These creatures become reproductively mature once they become 4 to 5 years old. The male ones fight each other for mating rights. The migration of Rough Skinned Newts to water takes place during the breeding season. Once a mate is selected, the male and the female creatures migrate to a suitable breeding spot. The male newts reach the place first and transform into their aquatic phase. They develop light colored smooth skin, swollen cloacal lips and larger, more flattened tails that help them to swim. After some time, the female creatures reach the males. The females also transform before breeding, but do not go through as much change as the males do. The female Rough Skinned Newts lay eggs along vegetated edges of lakes, reservations, slow streams and ponds. They attach the eggs to stems and leaves of the plants submerged in the water. The eggs hatch after 20-26 days. The time taken by the eggs to hatch depends on the temperature of the water. 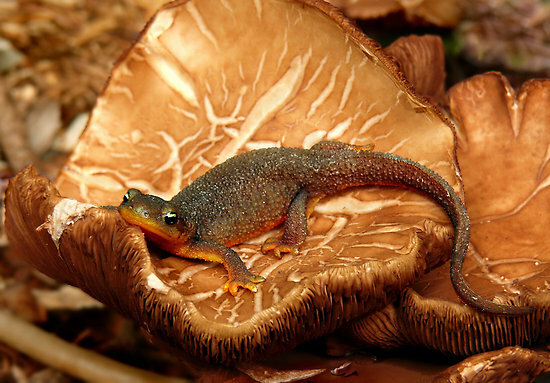 In some locations, the Rough Skinned Newt larvae take 4-5 months to transform. In other spots, the process of transformation completes in the following summer. After metamorphosis, the young creatures move onto the lands. The approximate lifespan of these creatures is 12 years. The larvae of this species live in the water before they are fully grown. The larvae feed on protozoa. The members of this species have the conservation status of non-threatened. Some scientists say that UV-B exposure can be harmful for Rough Skinned Newts. Some people keep these creatures as pets. But as they are highly poisonous, it is best not to allow children to keep them. There are a few things that you have to keep in mind to take care of the Rough Skinned Newt. As these creatures partly live in water, they should be provided with a small pool. It is not advisable to over-feed the newts. You should never feed your pet with the insects found around your house or even wild pests. They may carry diseases that could be harmful for the newt. You should always remember that the newts of this species are strongly poisonous. So, always remember to wash your hands after handling your pet newts. Rough Skinned Newts are believed to be the most poisonous species of all newts. But that has not stood in the way of their popularity as pets. They can be quite harmless and make good pets if their owners take the necessary precautions. Here are some Rough Skinned Newt photos for you. Check these out to know how these creatures look like.